NJR has a longstanding tradition of service to the community that goes far beyond customers’ energy needs, focusing on education, wellness and the environment. We’re proud to be part of our customers’ lives and the communities we serve. Our team demonstrates energy, enthusiasm and passion for giving back. We believe vibrant communities create opportunities that allow residents to live fuller, more rewarding lives. As a reliable partner, we are proud to do our part to help to make our communities better – together. Employees and retirees work at the grassroots level to help strengthen the communities we serve, giving generously of their time through our Volunteers Inspiring Service in Our Neighborhoods (VISION) program and other initiatives. These programs give employees the opportunity to create change in fundamental ways. Our employee volunteers worked with AmeriCorps and the United Way of Monmouth County to help displaced families return home in the aftermath of Superstorm Sandy, rebuilding and furbishing homes in Keansburg, Port Monmouth and Union Beach. NJR’s employee giving and gift-matching program inspires philanthropy, allowing employees to make a greater impact in their communities. Employee fundraising efforts further benefit nonprofit organizations near and dear to their hearts, including the March of Dimes, American Heart Association and American Cancer Society. 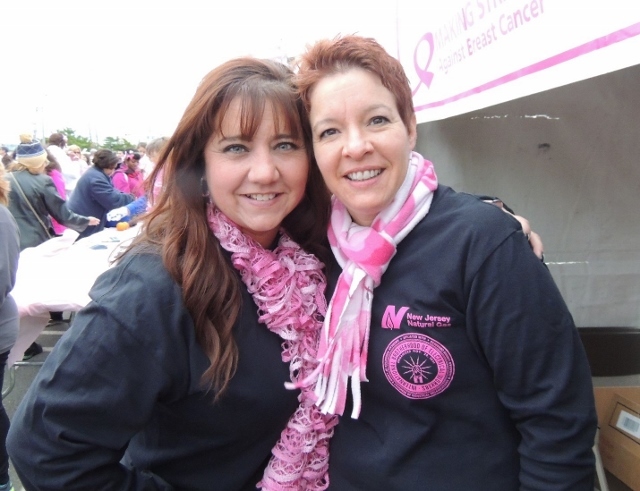 For more than 20 years, NJR has been a fundraising partner with the American Cancer Society, Making Strides Against Breast Cancer initiative. From participating in walks to holding Jeans Days, our employees are proactive in raising much needed funds to help support programs in the fight to find a cure for breast cancer. Our commitment to improving the quality of life for families throughout our service territory is evident in our Home Ownership Program. Today NJNG works with nonprofit organizations in Monmouth, Ocean and Morris counties to help renovate and build affordable housing, providing the opportunity for qualifying families and individuals to become first-time homeowners. First-time home buyers are joined by representatives from Interfaith Neighbors, the City of Asbury Park, U.S. Department of Housing and Urban Development (HUD) and New Jersey Natural Gas (NJNG) to celebrate the completion of their new home as part of the Interfaith Neighbors and NJNG Home Ownership Program. We believe our efforts must extend beyond our own operations to help preserve and protect the environment. As active participants in the communities we serve, our engaged employees lend their support to improve the quality of life and the environment. Each year we partner with local communities to sponsor and participate in beach cleanups, working hard to remove litter from the beaches and coast line of the Jersey Shore.